The Monday after Labor Day (September 10th) the website will be inaccessible while maintenance is being performed. This process will begin late Monday morning and may take hours or up to several days to complete. Once the website is accessible again we will notify TWOQC members via email. Thank you for your patience and understanding. An enthusiastic audience of nearly 200 hundred welcomed professional makeup artist Elise Marquam-Jahns for our program Monday night. Elise presented information about skincare and make-up designed specifically for women of our “rank and age” (50+). Keeping skin healthy requires eating well with lots of fruits and veggies, reducing refined sugar, using a good sunscreen (SPF 30), lots of moisturizer, and getting good sleep. Lucky member Diane Wilson volunteered and was selected for Elise’s makeover with a focus on techniques to enhance eyebrows, renew eyes by using just the right shadows and liners, and brighten cheeks with just the right blush. Selecting the best colors depends on your skin tone, whether it is cool or warm. She provided this homemade recipe for an easy, reliable age spot treatment. Elise’s presentation was informative and helpful. Vámonos! (“let’s go!”) We all need to get seats at the TWOQC October 29 Fiesta Luncheon. There are already 9 tables gone, and multiple scattered groups have adopted seats. Member Sandi Beach has a whole team gathered to put up all the exciting decorations. We are having talented young Mariachis for the entertainment, a fiesta salad with the taco strips in the shape of the Mexican flag, and yummy Mexican wedding cookies. Tickets for Oktoberfest are going fast! We sold 158 at the program on Monday but we still have some good seats for groups of 4-6 and five full tables of 10 left. If you missed the program and would like to order tickets, please contact Peggy at positivelypeggygv@gmail.com or call (520) 207-6188. If no answer, please leave a message and she will call you back. Cash or checks only payable to TWOQC Charity Account. Kathi Krieg was born and raised in San Jose, California. She worked at Raley’s Superstore for 29 years before retiring in 2005. She held many positions, during those years “wearing many hats”, she says, including cashier, bookkeeping, training employees, and as the customer service manager. Kathi moved to Modesto in 1976 and married her husband, Jerry, in 1984. Jerry became a great husband but a terrific stepdad and step-grandfather to Kathi’s two daughters and four grandchildren. Kathi recalls volunteering for Relay for Life – walking while staying awake all night on a football field in tents and even watching a movie (“Erin Brockovich”) inspired her sense of giving back. Kathi and Jerry moved to Quail Creek in 2007. The couple enjoy living here, where Kathi says “the friendships they’ve made are the greatest”! They both love vacationing in Hawaii. Kathi enjoys golfing, reading, playing bingo, going to the movies or just kicking back and watching television. Her primary participation in TWOQC has been the Military Families Baby Shower, in which she stepped up in 2018 to Chair the event. What a grand summer TWOQC have had! Attendance at our June luncheon, summer programs, and New Member Welcome Parties flourished. It is a joy to greet many new members and we are elated that they are eager to jump in and become involved. A special “thank you” to our newest members: Pam Hartwell-James, Carin Kaiser, Tootie Miller, Mary Smith and Kathy Westerburg for greeting 14 new guests and welcoming almost 200 members at Monday’s excellent program. At Monday’s program we added five new members to TWOQC. Please welcome: Patti Baker, Carol Dixon, Cindy Granger, Evie Lamb, and Jan Thiesen. We look forward to seeing you at the Wine and Welcome Party on September 27! Prior to the presentation on Monday, the general membership voted on and approved the changes to TWOQC ByLaws. The ByLaws can be found on our website under Organization. Wow—your donations for the homeless and hospitalized veterans turned in at the program on Monday were over the top. So much cutlery, disposable plates and snacks, not to mention all the toiletries and calendars. When Peggy McGee and I delivered all the items to the VA on Wednesday, they brought smiles to the staff members who work with the veterans. 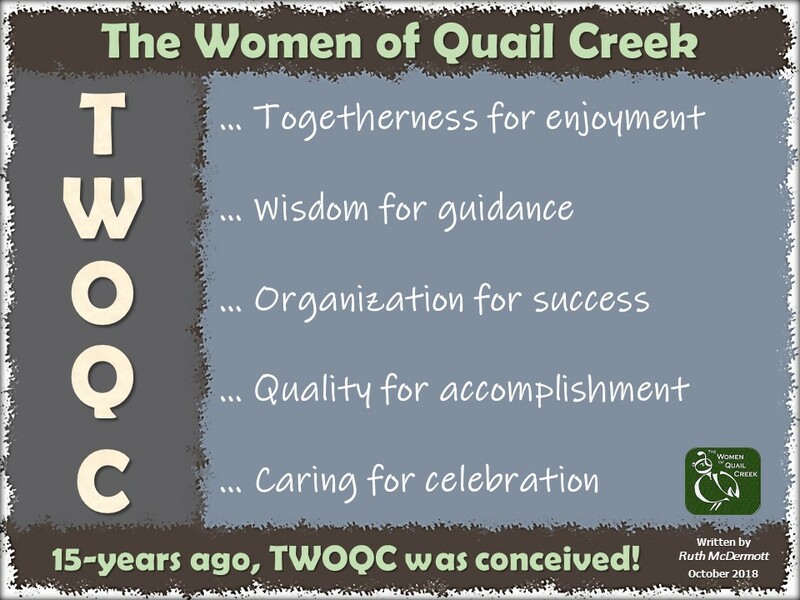 It is clear that the members of TWOQC believe in supporting Youth On Their Own. Your contributions of school supplies (and food items) at Monday’s program brought our total giving to over 1,300 items. This year’s school supply drive has clearly been a big success and will help countless students have a more positive school experience. As we bring this year’s drive to a close you will see appeals for supplies published in What’s Happening, giving the larger Quail Creek community a chance to contribute if residents have just returned from summer travels. But, for the members of TWOQC the work is done for right now. A hearty THANK YOU for your support. Want to get involved in this worthwhile cause and have fun at the same time? Planning for our 2019 events are well underway and we need YOUR help. Please contact Lisa Johnson fashionshow@womenqc.com to get started on a committee. “Thank you” to this week’s FMM contributors: Marianne Cobarrubias, Yasmin John-Thorpe, Lisa Johnson, Peggy McGee, Janice Messer, Carol Mutter, Diane Quinn, and Angie Werner.